Upon entering the gallery I was immediately drawn towards ‘When the Heavens Meet the Earth’ (2011). 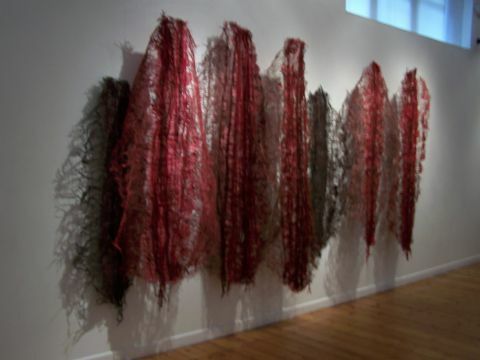 This is a large scale work stretching along an entire wall and measures 274 x 457 x 183 cm and is made from burlap, acrylic and dye. It is fixed to the wall and suspended from the ceiling. In terms of scale it is like a large landscape painting and entirely dark brown in colour. The loose weave of the open textile suggested to me a sense of lightness and floating and I thought about clouds floating across the sky. Yet at the same time the woven structure and the dark heavy twisted strands suggested the earth’s formation, landmass and strata. The work is suspended from the ceiling and comes out from the wall in relief giving it a sculptural quality. It seems to capture a moment in time; perhaps the point of creation or the meeting of mortal and immortal. ‘Fragments’ (2011) on the opposite wall is made of burlap, handmade paper and dye and is smaller in scale measuring 147 x 137 x 30 cm. It is purple, grey and silver. I found myself standing up close to take in the intricate structure. Discarded everyday material is made into something so beautiful and delicate. The discarded fragments have been brought together to be reused and made into something completely new. That is the process of metamorphoses, the title of this exhibition. ‘Emissaries’ (2009) looked like textile wall hangings but being human size in scale suggested six people with purpose and determination. Standing up close to the work I was aware that five of the pieces were positioned to appear taller than me giving them a sense of authority and power. 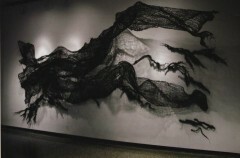 They are made from handmade paper, dye, burlap, jute rope and yarn and collectively measure 274 x 366 cm. ‘Threads of Time’ (2011) in the second room of the gallery caused me to think on whether time is linear. This piece suggests that all moments in time are related to each other: woven together like the makings of a rug but at the same time unravelling. Life is unpredictable with order and disorder. This piece measures 145 x 150 x 25 cm and is made from rope, handmade paper and dye. 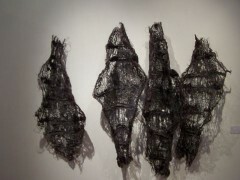 In the exhibition there were works made form burlap, dye, yarn, rope and paper and works made from clay and burlap. Okore is using the same materials as in the 2008 exhibition but this time in a new way. In 2008 she was focusing on the transformation of organic material into a commodity by manual handworking like sewing or weaving. Now she is taking the materials back to their original sources. As a whole this exhibition conveyed a sense of transition. Our journey through life is one of ongoing change. I found myself going into a reflective mood having first taken in the wonder of the scale and beauty of the works. The woven threads spoke to me of the interconnectednesss of life and my sense of place in the world. Using such ordinary materials to create such beautiful art raises questions about the value placed on different things in our society and how much we waste and fail to appreciate. Jaquinta is an artist based in London.